Finally, let the celebrations commence because we are back! When we announced our downtime we did make a promise along the lines of “when we declare ourselves stable we’ll have a nice big celebration of awesomeness. You’ll have to wait and see what that entails!” Well, it is time. We missed providing you quite a few articles over the the last week, so now we’re going to make up for it with constant articles for the rest of the weekend! The first of which is Alex’s “”Back to Basics” with Skyward Sword – The Game World”. Out of the three plus years that Zelda Informer has been around, last week was the worst time that we could have possibly had to go offline. Why? Well if you didn’t know already, February 21st was the 25th anniversary of The Legend of Zelda series. 25 years since the Japanese release of the original Legend of Zelda. Zelda has made it to the silver anniversary and is still going strong. 2011 looks to be one hell of an anniversary year with Skyward Sword on Wii, Ocarina of Time 3DS and Link’s Awakening on the 3DS virtual console. We’ve missed the big day so instead let me present to you what I think is the best Zelda fan art ever. This mural was made especially for the 25th anniversary, and the awesome thing is that the snippet of it above is only about one-fifteenth of the whole thing. It is massive, it is awesome. Thanks first goes to our forum staff member Ruby, as well as Zelda Universe for bringing this piece to my attention. You can find the whole picture below at a reduced size. The full image can be downloaded here as a JPEG file of 7.08MB, measuring 1200 x 6566. When cut into sections it makes great wallpapers for your desktop. 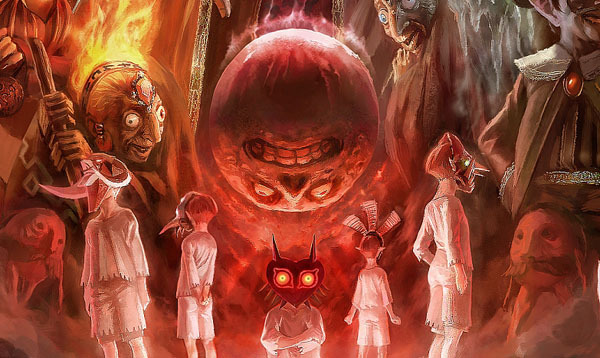 No surprise that its the Majora’s Mask section that I decided to highlight in this post hey? Below the image you can find the list of everybody who’s in the artwork, and also a video on the making of the image, which I found over at Zelda Universe. I’ve got to give credit where it is due because this stuff is too good not to show. To save the most important credit to last, the artist of this masterpiece goes by the name of Ag+. Enjoy.